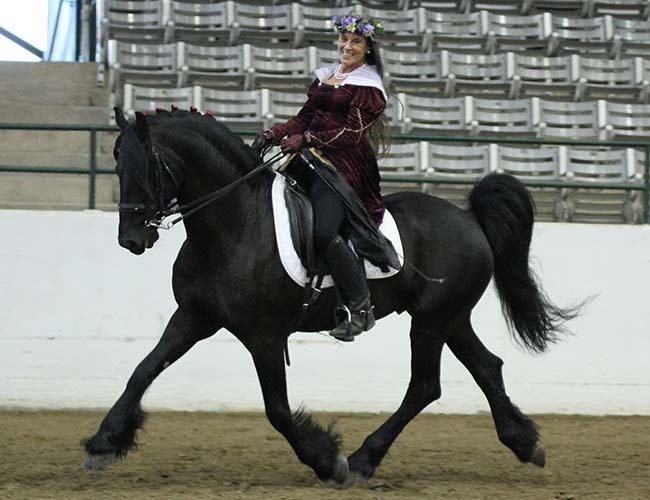 Pam Fowler Grace - Sun and Shield Riding Club News - Welcome! If you would like to join in the fun - contact us! 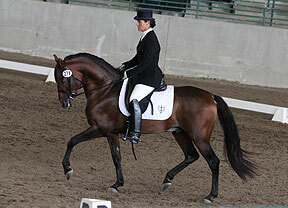 Pam is coaching and mentoring Jeffrey Bashaam in dressage and horse mastership. 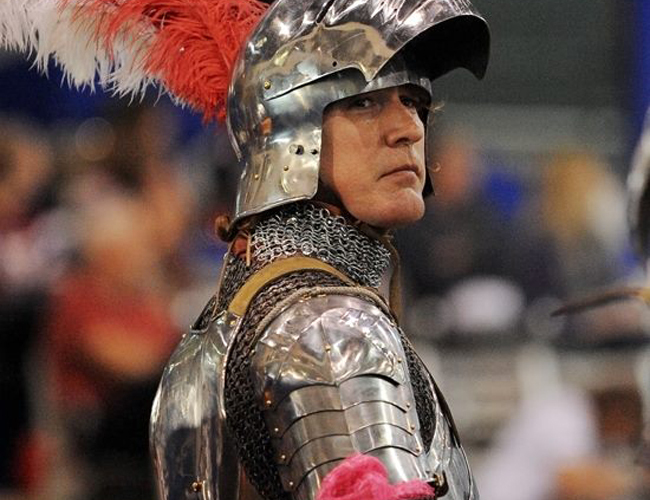 Jeffrey has become quite the accomplished horseman and has used dressage to make him an international jousting success in a very short period of time. 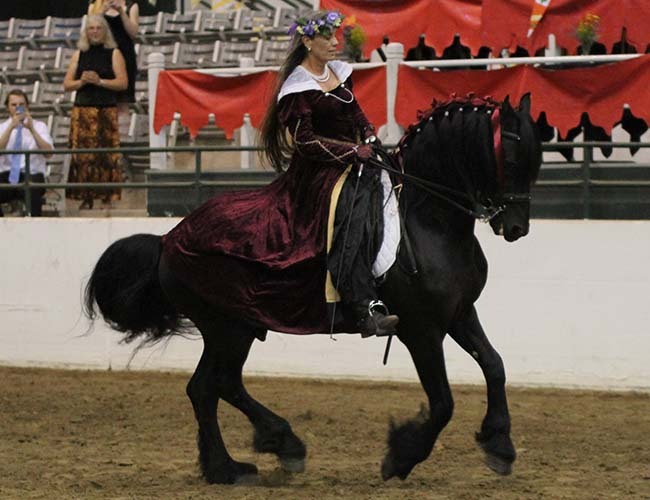 He has his mare, Pooh, trained to third level dressage and also is using progress through the levels of western dressage and working equitation as well. Here is a quote from Jeffrey and the highlights from his show year. Pam is extremely proud of you, Jeff, and says, "I admire you so much for your dedication to excellence, your compassion on and empathy for the horses, and your integrity. It is a pleasure to work with you!" 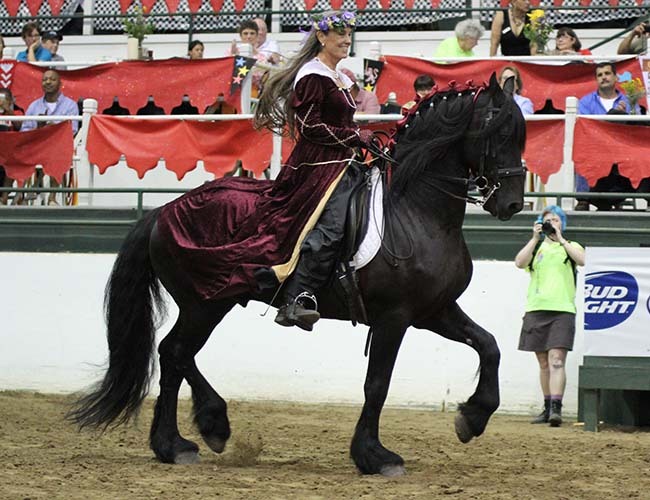 "Pam has such a way about her that is uplifting; her methodology of positive reinforcement and praise brings out the best in horses and people. 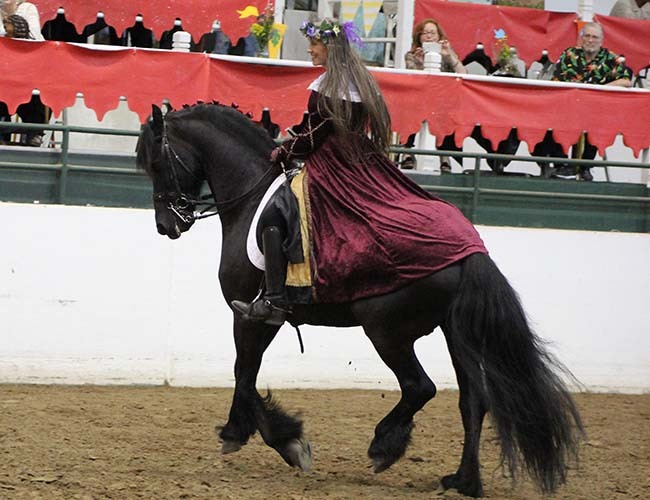 By and large her guidance has shaped my understanding of horses and enabled me to make an impact in the recreation of Chivalric Equitation." 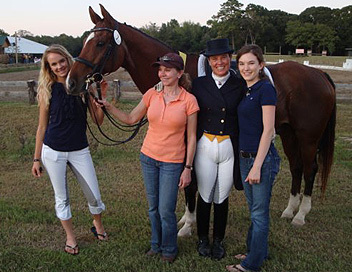 Brittany Bartlett had her introduction to international dressage when she was hired on at the age of 18 as Pam’s groom for the Olympic trials, which stretched from Florida to California. Pam smiles and says, "She got thrown in the deep end and came up swimming!" 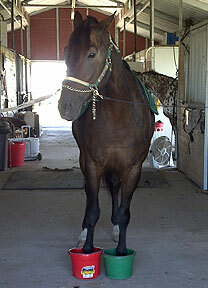 My 14.2 Straight Babson Egyptian Arabian, Kahlidah Kamar Rou, and I started working with Pam Grace when Kahli was still just a green 5 year old. I had started her as a three year old, but had then decided to give her a year off to mature and had spend her 4 year old year just putting miles on her, mostly out in the fields and paddocks of the farm. 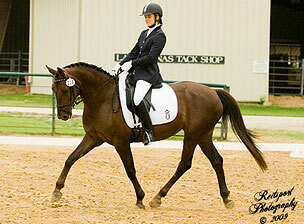 When it came time to further Kahli's career from Sport Horse In Hand classes, I knew who just to turn to. 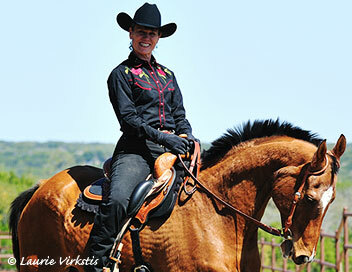 With Pam's expertise, we have gone on to a have a very successful under saddle career. In two short years, Kahli has earned many titles and accolades, and continues to add to her ever growing list. 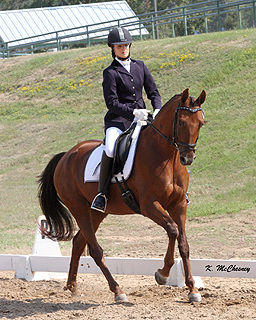 In 2013, Kahli started her Dressage career and rode in 12 classes with an average score of 63.613% in Training Level! In 2014, we started throwing in some First Level Tests as well, and by the end of the year, Kahli was scoring 63%s in Open Breed Competitions! The little girl was really beginning to learn how to dance! 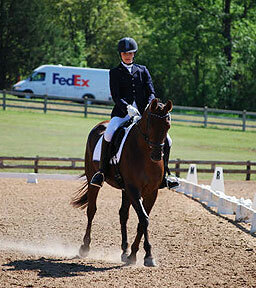 Our Training Level scores were also improving and Kahli's highest score to date is a 72.5%! Kahli even decided that the Western Dressage looked like fun, so we even showed in those classes with Pam's help and got two 64%s! We cannot wait to see how far we can go with Pam! We know the journey has just begun! Pam says, "The sky’s the limit! Go Britt! You have become such an educated, beautiful, tactful, skilled, and soft rider. I couldn’t be more proud!" 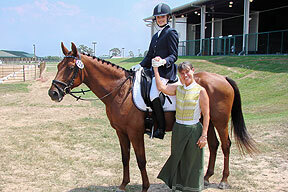 Charlie Sokolov and her sweetheart mare "Rosie" began their journey in traditional dressage together in 2009, and then decided to dabble in western dressage last year. 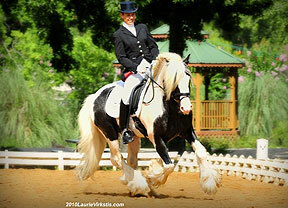 Charlie clinics with Pam and also rode in the western dressage clinic Pam taught in July. Charlie contacted Pam from the road on his way home from the WOAA Championship Show at the Built Ford Tough Center in Tulsa, OK where she and Rosie placed Top 5 in all of their classes and garnered a World Championship title with a score of 70% as well as a Reserve World Championship title with a score of 68%, both from S judges. 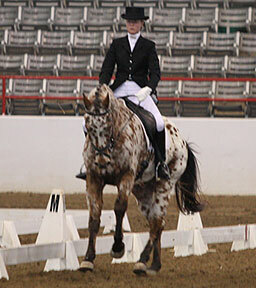 She also was the Level 1 Junior High Point winner. 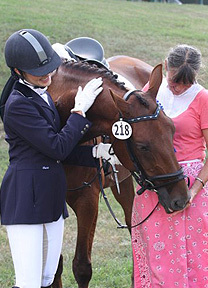 Charlie thanked Pam for the "ring craft" she taught her and dressage technique which took her and Rosie to a world class level. Congrats Charlie! 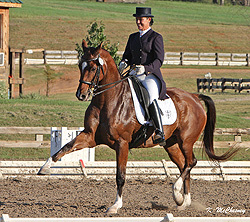 Dana Mickey on the dressage champion 'Major', owned by Wayne and Peggy Gordon. 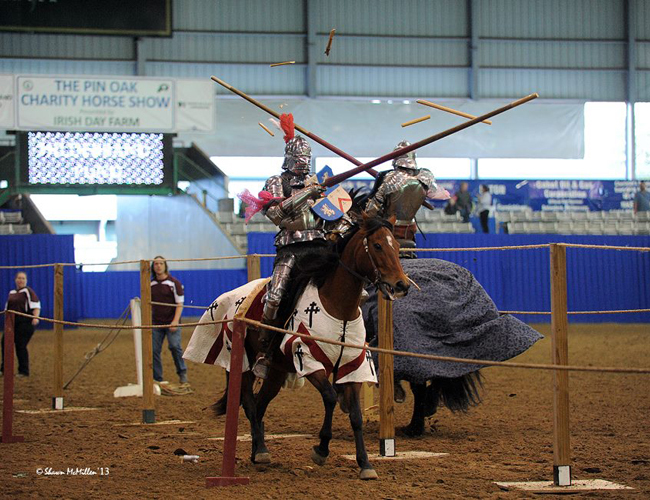 a'Plaisance headed by Steve Hemphill hosted a grand international jousting competition which benefitted the handicapped riding program S.I.R.E. at Great Southwest Eq. Ctr. In Katy Tx. and it was a smashing success! 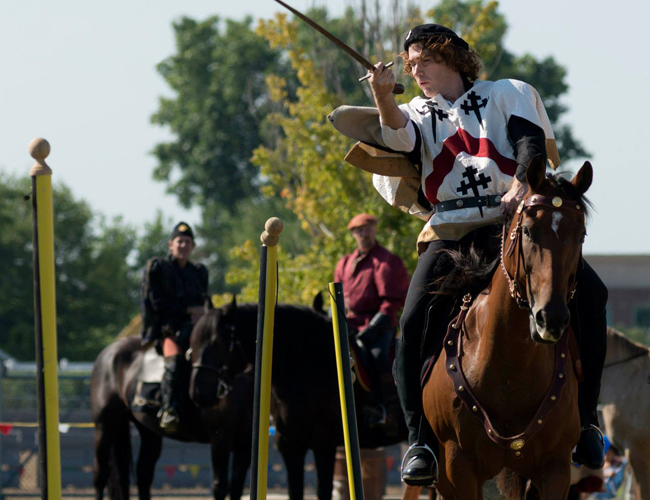 The best and highest ranked jousters from the U.S. and Europe competed and thrilled the audiences. 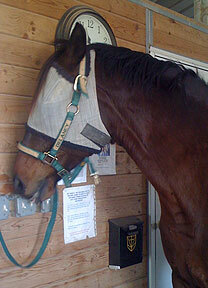 Jeffrey's super star, "Pooh", ended up in colic surgery instead, but thank God she's ok now! 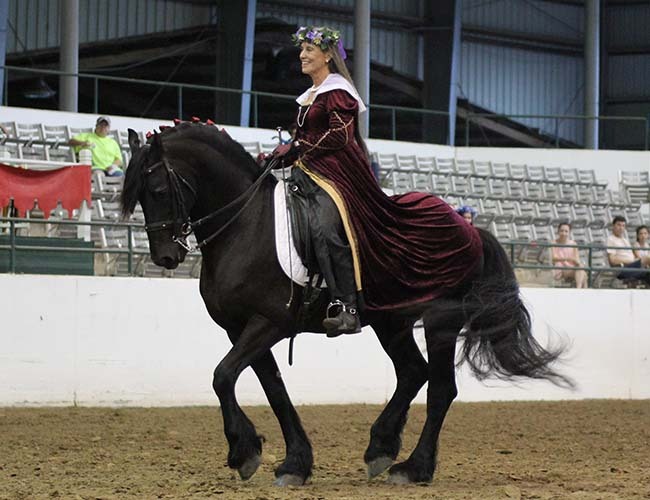 Pam did a breathtaking medieval Grand Prix musical freestyle performance on the stunning Friesian stallion "Dierderik" to kick off the Saturday evening finals and then watched the rest of the show with her students. Enjoy this slide show of beautiful pictures by Kelly McChesney of a magical evening. age. 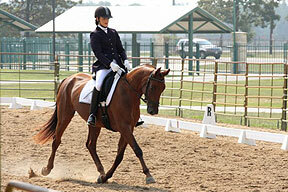 USDF Gold Medalist and L Graduate, Pam Fowler Grace, was the guest clinician for a two day Dressage Workshop at the beautiful Austin Equestrian Center at the Reserve near Lake Travis in early March. 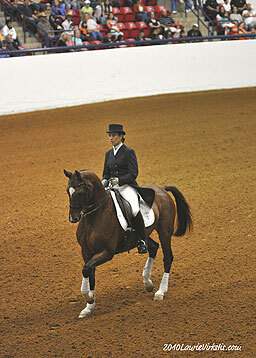 The clinic was unique, as both traditional and dressage for Western riders was emphasized. 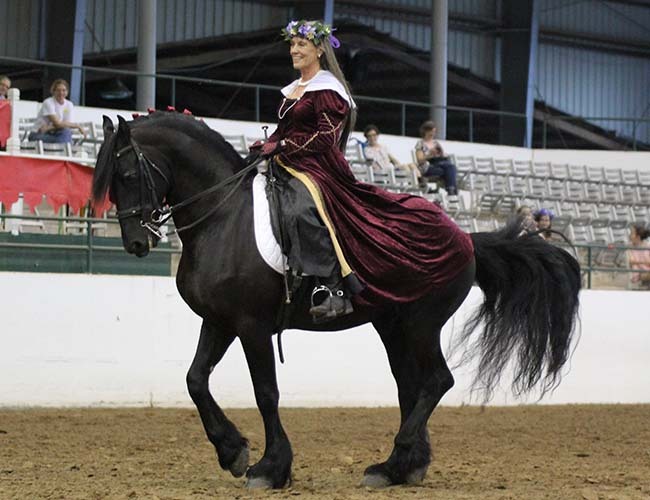 Pam also treated us to one of her fabulous freestyles on her Dutch gelding Star in Stripes, "Kossini," debuting a newly designed Western saddle just for dressage riders by Circle Y Saddles. Pam has been involved in the design and fit this unique saddle. 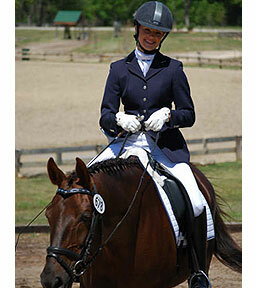 Circle Y Saddles hopes to have the Western Dressage saddle available for sale in the next few months. 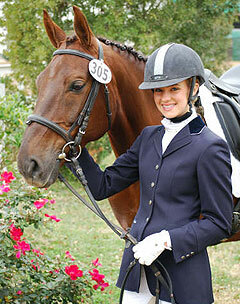 Local Houston area dealer is Charlotte's Saddlery in Houston, ask for Bill. 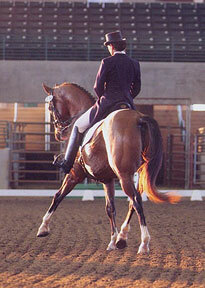 Interested in learning more about Western Dressage? 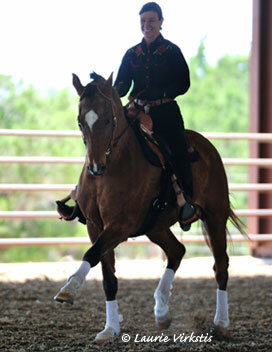 Next clinic is April 12 & 13 with Pam Fowler Grace in Austin.Call Laura Jones at The Reserve for details and to sign up for the clinic: 713-703-5109 If you are not in the Austin area and would like to learn more about hosting a clinic in your area - click here. To read the complete article as seen in the Horse Gazette - Click Here (courtesy of Luarie Virkstis). Do You Need a Helpful Hoof? Hot on the heels of a very treat-lucrative holiday season, Delaney has extended his "Helpful-Hoof" offer and has expanded his repertoire to include Lessons for Greener Living! If you find yourself in need of a helping hand (or hoof) we have just the man for you. Meet Delaney - he's always ready to help, doesn't mind getting his feet wet and doesn't shy away from the dirty cleaning jobs that require a mop and bucket. He is available for hire - but he doesn't work cheap! Word to the wise, you will want to provide oversight, as if he is left unattended for even a few minutes, he'll find something to get into! 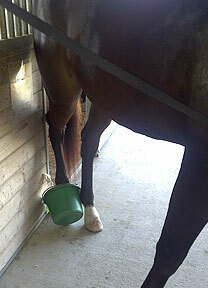 He has a penchant for buckets and can find and maneuvre them into position with any of his feet. He is a very dexterous and entertaining boy, and clearly needs to be busy. After the success of his "Holiday Helping Hoof" offer, Delaney decided to expand his services to include 'Lessons for Greener Living". That's right, he can help set a good example in your house by teaching the kids to turn off those lights when they leave a room. If they won't listen to you, they'll listen to Delaney and he'll show them how easy it is to do - he can do it practically blindfolded! Send your job offers to the stable and be sure to include detailed information about the treats he may expect for his work. All offers will be entertained on a first come, first serve - treat considered - basis. His schedule is filling fast, so don't wait! 2010 brought together family and friends to enjoy the holiday complete with cajun fried turkey and all the trimmin's. 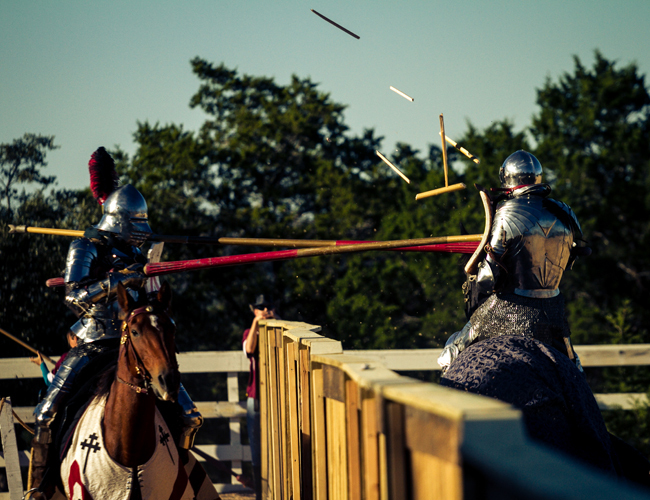 Enjoy the pictures below from our little stable scrapbook. We hope you enjoyed the holiday season with those you love and best wishes in the coming new year. Pam's show team descended on Windy Knoll Farm in late September and mopped up! Sir Ivanhoe won both of his classes with scores in the mid 60's. 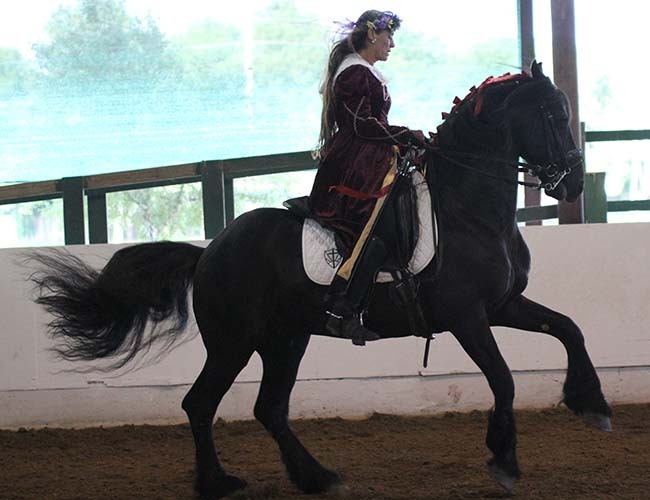 Juan Francisco won both of his classes with a 67.5 and a 68.8 with Pam aboard, and also won the Junior division with Robert up, who scored a 60.7 and qualified for the Andalusian Nationals (IALHA) with a very well executed test. The show's superstars were hands down Pam and 'Star In Stripes' who drew large crowds to watch their Grand Prix musical freestyle which scored 70.87 and 76.5!!! A fun time, a great show and congratulations to all for jobs very well done! 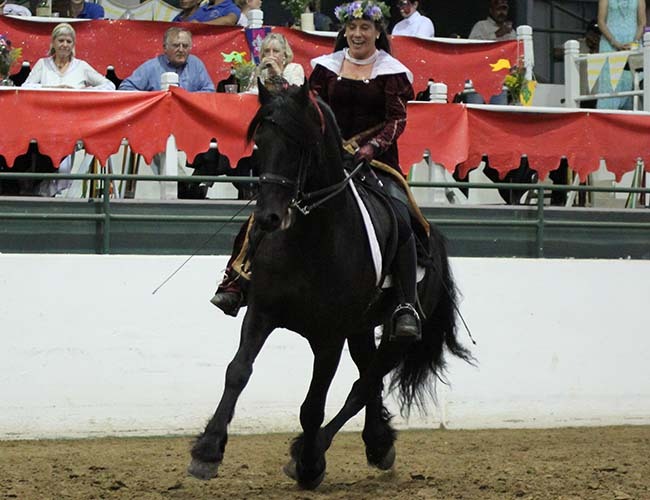 The opening act scheduled for the International Andalusian & Lusitano Horse Association (IALHA) Nationals Gala was Pam Fowler Grace on "Star In Stripes." A long-time member of the IALHA, Pam was asked to come to Fort Worth and dazzle us, and she did not disappoint. 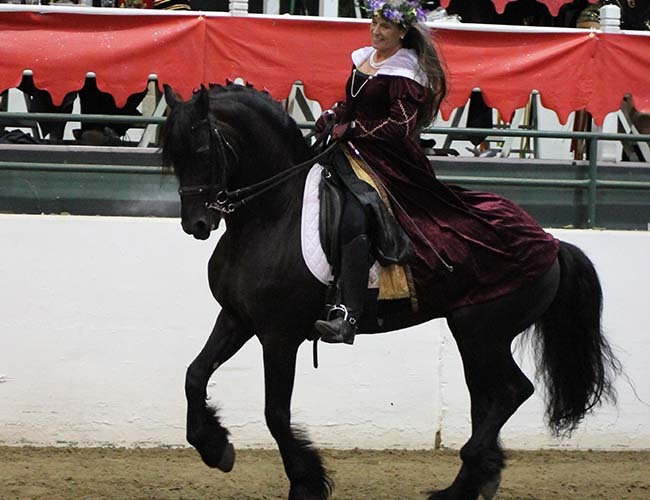 I was delighted to see Pam smiling from ear to ear while performing her beautifully choreographed dressage musical freestyle to a medley of American anthem music. 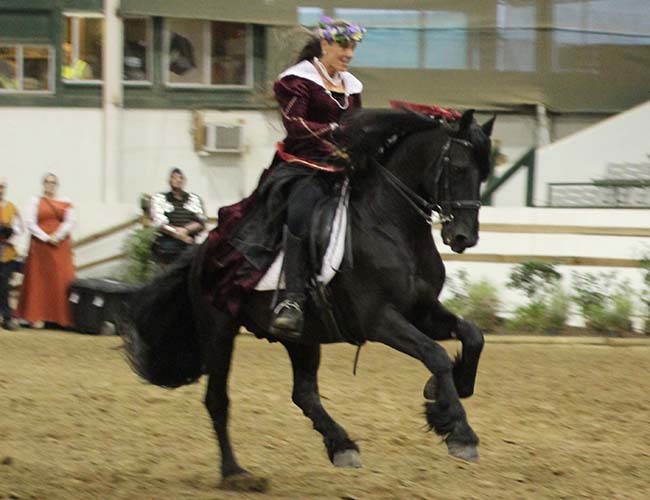 As a dressage rider myself, it gave me goosebumps to see her perform in time with the music and execute the high school movements we all strive to ride one day. It was a perfect all-American way to start the evening program and set the tone for all the extraordinary riders and horses we were about to see. 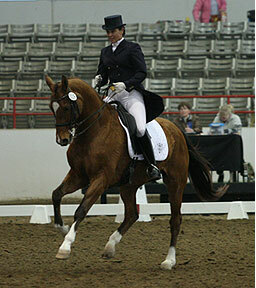 After the opening performance the National Championship competition began. 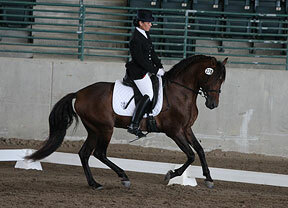 Pam was Reserve National Champion on Juan Francisco in Training Level dressage. 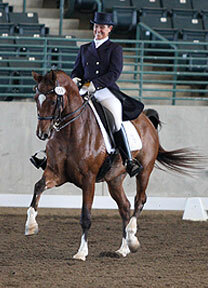 Robert Hilliard, her student was Junior National Champion also on Juan and his brother Patrick Michael Hilliard was National Champion Junior Equitation on Laura. It was a fantastic show and Pam is very proud of all the hard work and ribbons earned by her students and Juan Francisco. 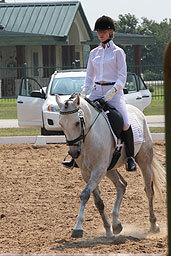 The Houston Dressage Association's Laborious Days Shows held in Conroe, Texas were alot of fun. 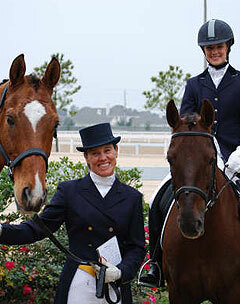 Sir Ivanhoe of England (left), owned by Diane and JP Poirer was a favorite of the judges scoring a 66.8 and a 70.4! Juan Francisco (below right), owned by Kathryn Wexhiemer, also had a great show with scores in the mid sixties. 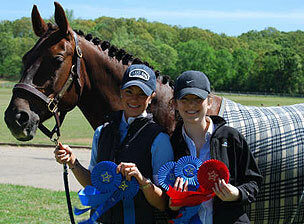 Pam was so pleased with both horses and also with Robert who did a wonderful job riding Juan in the junior division. 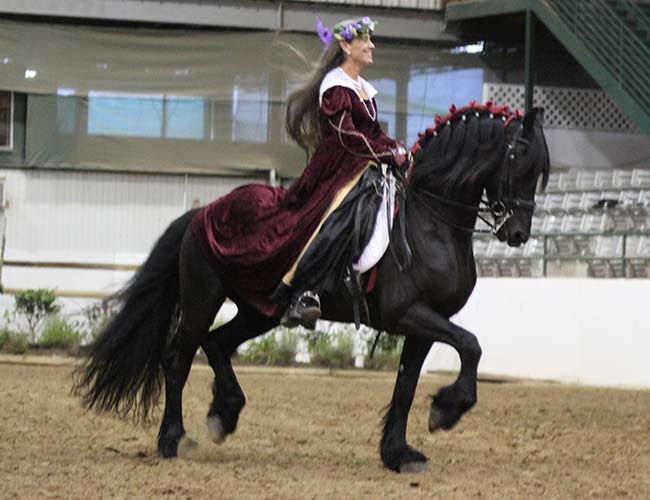 September 18th, Pam rode Sir Ivanhoe of England to first place with a 66.3 and training level Champion honors at the Sonesta Farms Show in Cypress, Texas. Some Exciting New Stars are Emerging from Pam's Training Stable! Some exciting new stars are emerging from Pam's training stable this year. 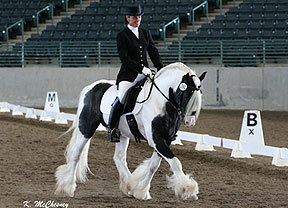 Sir Ivanhoe of England, a Gypsy Vanner stallion owned by Diane and JP Poirer made his spring debut at the two Hearthstone Stables and two Sienna Stables shows winning both of his classes at all four shows. 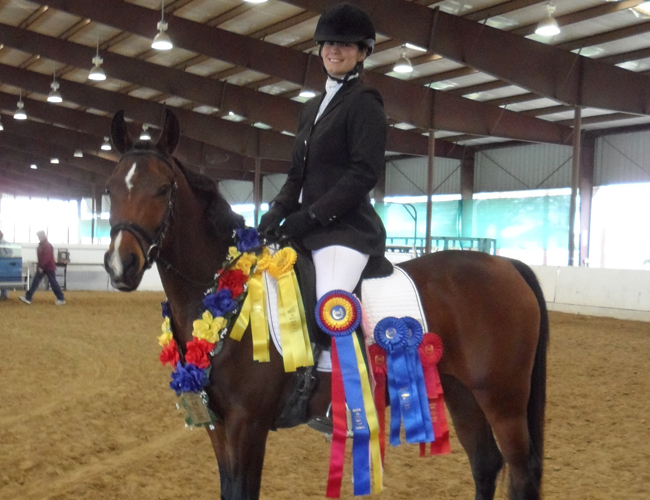 With these ribbons under his belt, he worked hard at home and made his first sanctioned show debut on May 20th and 21st at the Alamo Dressage Association show in San Antonio again winning his classes and qualifying for the championships! His second sanctioned show was on May 29th at the Great Southwest Equestrian Center where he won his training level class. 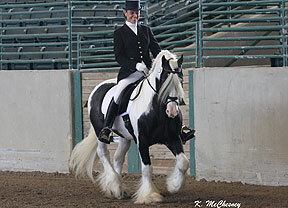 Congratulations to Diane, JP and Sir Ivanhoe on a knockout spring show tour! 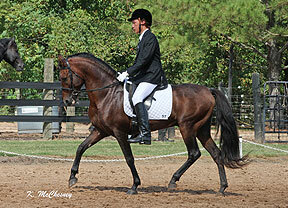 Also included in this new group of emerging stars are Syrah and Juan Francisco. 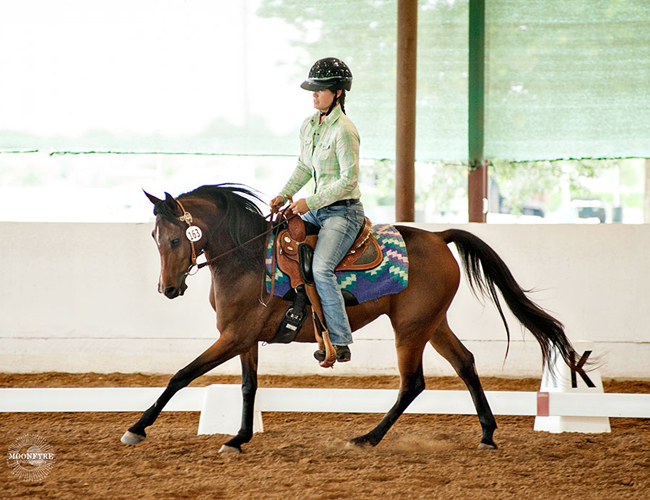 Syrah is a beautiful Oldenberg mare owned and shown by Amber Hughes (Above). 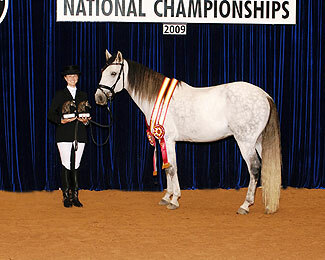 Juan Francisco is a gorgeous Andalusian stallion owned by Kathryn and Robert Dexhiemer. 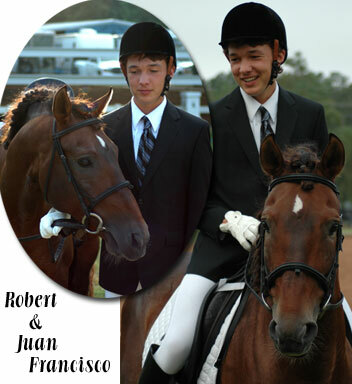 Juan and Robert both made their show debuts this spring. 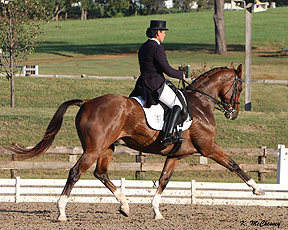 Juan's debut was at Great Southwest Equestrian Center where he took second to his stablemate Sir Ivanhoe. 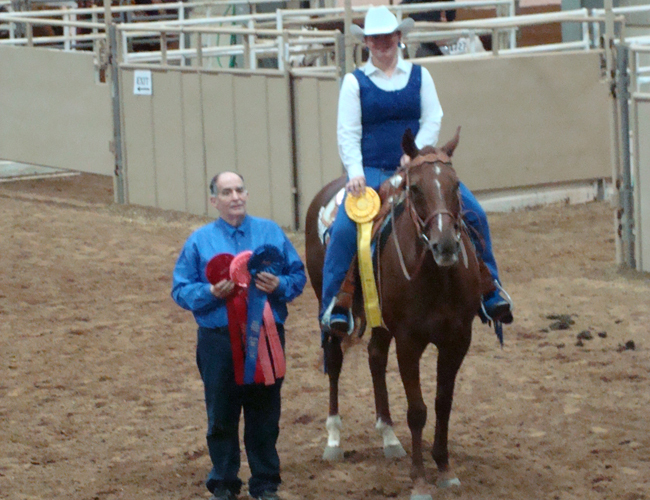 Robert Dexhiemer also made his show debut aboard Juan at Great Southwest and won his class! Needless to say Pam is proud as punch of each and every rising star in the barn. 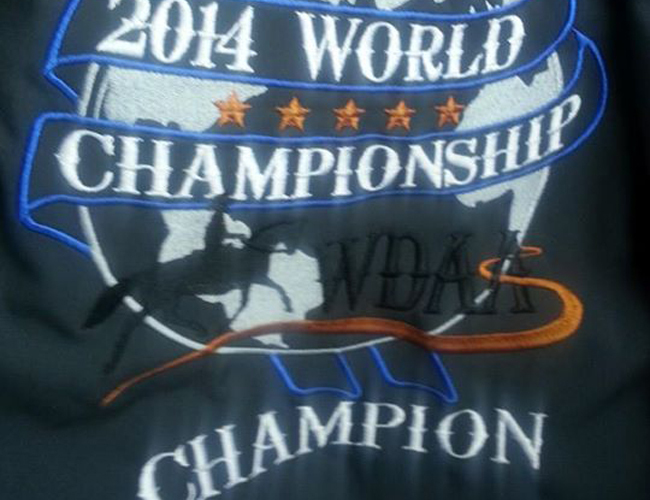 Congratulations to Reagan Mabray Berry, my assistant trainer, on her outstanding performances at the IALHA Nationals. The stars at night are big and bright.... deep in the heart of Texas !!!!!! Pam and Katie enjoyed another very sucessful weekend at the Texas Dressage Classic, a benefit for the Azleway charity, which was held at the beautiful Texas Rose Horse Park in Tyler, TX, Sept 25 - 27, 2009. 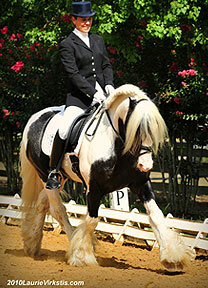 The park is nestled in a pristine setting overlooking acres and acres of rolling hills, barns, and show rings. 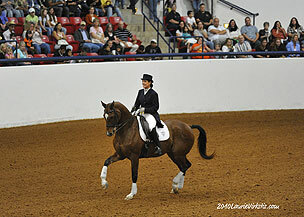 Pam and "Star In Stripes" competed Saturday evening in the freestyle challenge, which combined all of the F.E.I. levels. There was a VIP tent set up by the ring where guests were served a sumptuous dinner at their ringside tables as they enjoyed a spectacular evening of dancing horses. 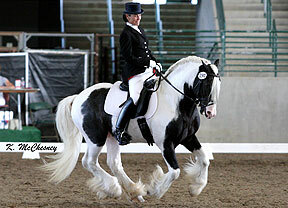 Pam and "T" delivered a passionate and very dramatic performance, which garnered a 71.1% score and entusiastic cheers from a captivated crowd. Katie won all of her classes on the princess "Bogota" with scores of Training 1: 73.043% and 74.783% and First 1: 71.000% and 72.667% winning all four tests. She was Training Level A High Point Reserve Champion and First Level AA High Point Champion...again!! We had a blast--what a fun weekend! Meagan came to the rescue again, and she was such a blessing to have there. She made The Princess just shine! Thanks to Lauren Donahoo for a beautiful braiding job on both "Tini" and Bogota. I was overwhelmed with a wonderful crowd of family support for Saturday's ride! A heartfelt hug to Pam for EVERYTHING. I proudly have the best trainer in the world. Thanks so much! YIPPEEE ! 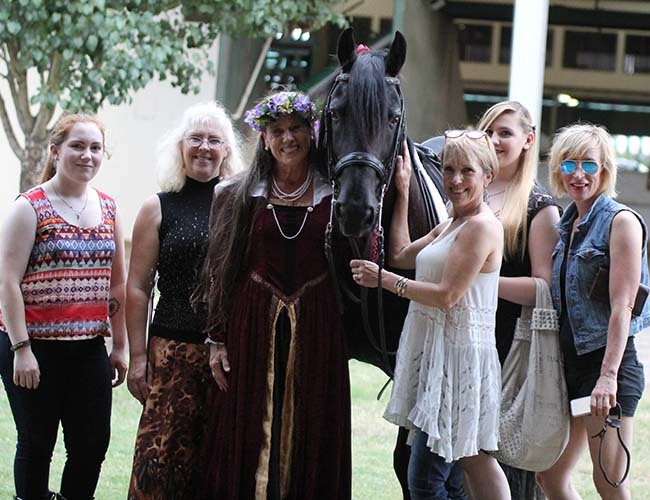 The show team from Sun & Shield riding club made a clean sweep at the Houston Dressage Society's Laborious Days Show which was held in Conroe, September 5th & 6th. We had a blast! Pam and Star In Stripes danced as if they were floating on air, with Pam's usual big smile lighting the way, they won the Grand Prix Musical Freestyle on Saturday with a 74%, as well as on Sun with a 70%! They were also the Musical Freestyle Champions for all the levels. WOW ! Way to go Pam and "T- Man" !!! Reagan Mabray Barry( Pam's asst trainer ) and her Lusitano " Paulo " won First Place on their first level test 2 class with a 67.5. Congrats Reagan and "P"!!! On top of that, Katie and" Bogota" mopped up winning all of their training level and 1st level classes (see her scores inset with photos). 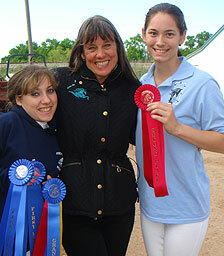 Then they came back and won the dressage equitation class to boot! 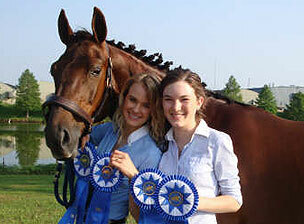 Katie and her super star were also high point amateur champions for the show. YOU GO GIRLS !!!! 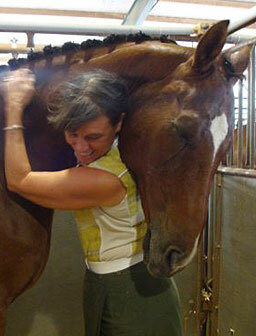 Reagan Mabray Barry and her Lucitano " Paulo "
Big Hugs to my Students and Horses...!!! 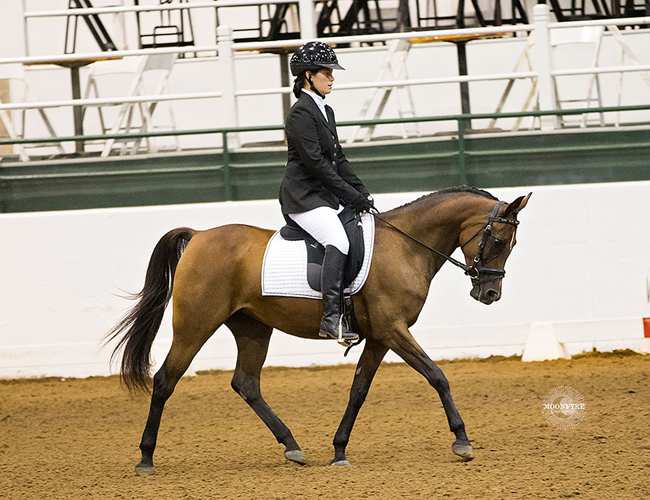 Katie Mauldin and her Oldenburg mare, Bogota... aka "The Princess" She qualified for the Championships for Adult Amateur First Level and got the two First Level scored needed for her USDF Bronze Medal. WAY TO GO KATIE !!! 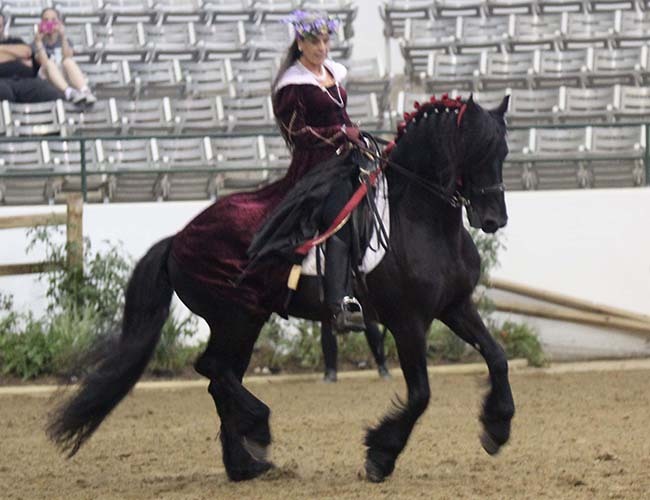 KUDOS also to Katherine McFaddin from Shreveport on the beautiful job she did showing her Hannoverian gelding at Prix St. George's. All in all, it was a great weekend. Sienna Spring Show was a huge success for all. 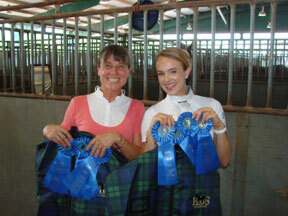 We had a great show, lots of fun and enjoyed good company between hanging up our ribbons. 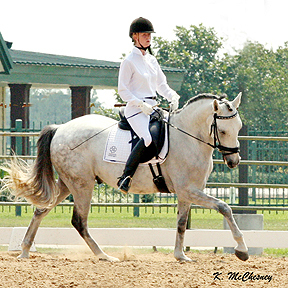 Reagan Mabray-Barry showed UNIVERSAL BLACKMOON, Morgan gelding owned by Jerri Ostendorf, in Training Level classes earning Grand Champion in a combined Open-Amateur Division. 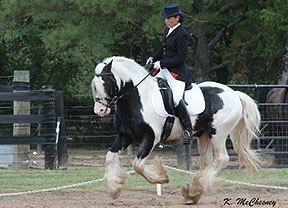 This is Universal Blackmoon's second time showing (he took Reserve Champion on his first time out). 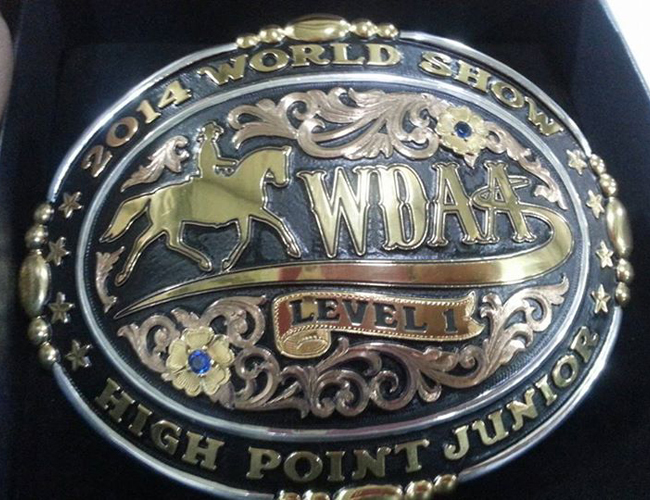 Honor Wallace was Intro Champion and High Point Junior on Leodinardo. Amber was Reserve Champion ( with 2nd in both intro classes ). 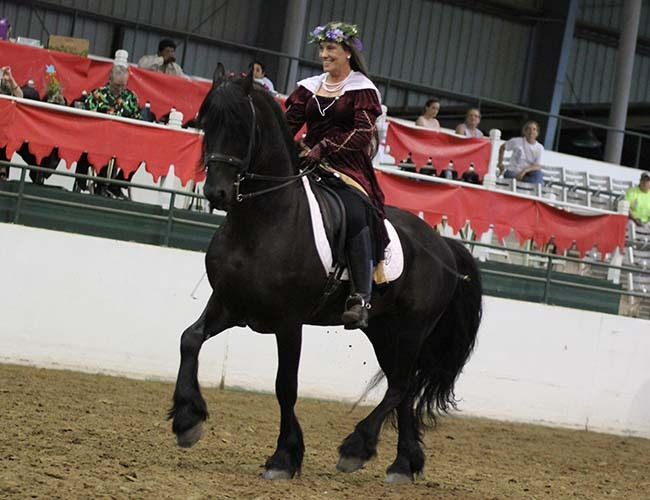 Pam rode Walter, a young Hannoverian owned by Elaine Yuins. 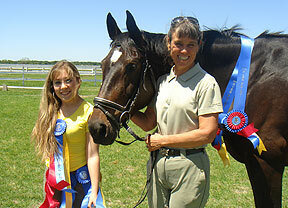 This was Walter's first show taking 2nd in training 1, and Pam also took 2nd on leodinardo in training level competition. Well Done - Congratulations All!!! 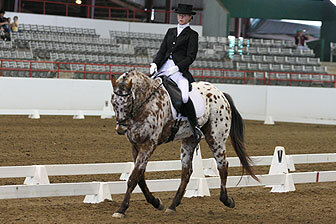 The shining stars were Katy Mauldin and her wonderful Oldenburg mare Bogota. This being Katie's first recognized show, she was well prepared, and turned the judges heads.... Pam could not be more proud of her performance and results. Was a breath of fresh air in this hot Texas summer. 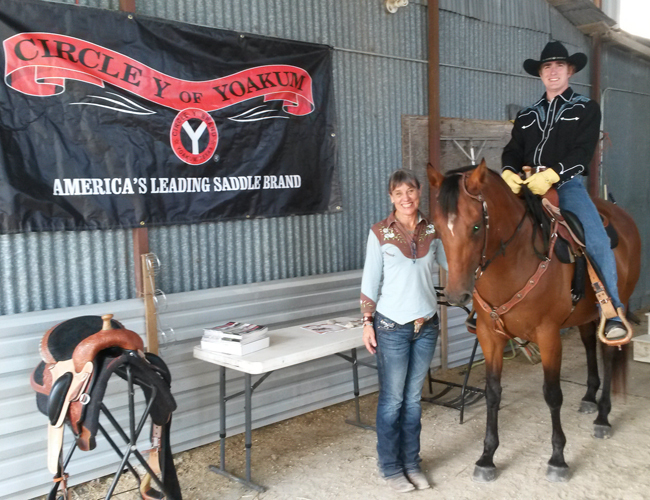 We had wonderful and very educational lectures and demos, something was learned by all! Pam taught all weekend, of course. Saturday we gathered in Pam's new barn and shared lunch and fellowship. Derek's band played and we sang praises together in the breezeway. Keith then lead us in prayer and we blessed the new barn. Saturday evening Pam performed a Grand Prix Freestyle to praise music on Star In Stripes, who danced his heart out! Sunday morning everyone sat in an amphitheater created from bales of hay and enjoyed breakfast with Starbucks coffee and then an awesome annointed worship service. The presence of God was undeniable, and a special bond was created between all who attended. Adolf Strickler for the shoeing consultation. Kelly Smith for her wonderful photography. Derek Freeman and his band for providing the music. Hugo and the crew for setting up and making the hay amphitheater in the new barn. We were blessed beyond our wildest imaginations... I think we have started something! We're already planning another one...! Copyright © 2006 - 2012, Pam Fowler Grace, Sun and Shield Riding Club - All Rights Reserved, with the exception of the photographic images which are Copyright by the individual photographers who retain all rights to their subsequent distribution.